Dried and smoked jalapenos are magic, and they reach super-nova status when incorporated into sweet applications. 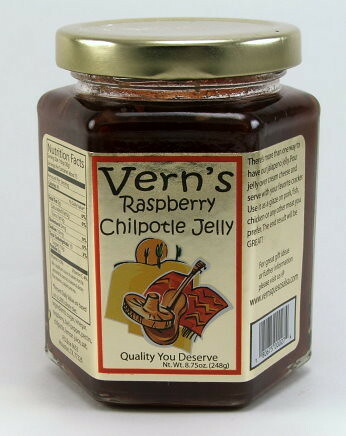 Like Vern’s Raspberry Chipotle Jelly, which is sweet and spicy. 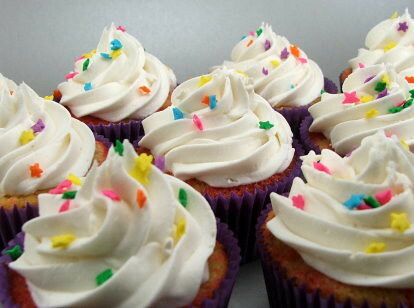 I have used it to fill danish, spread it inside turnovers, and now I have swirled it into vanilla cupcakes. 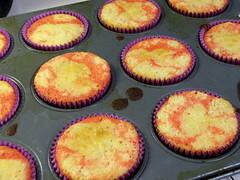 Inspiration struck looking at some rainbow tinted cupcakes a month ago. They were really pretty and I contemplated what would happen if each layer had a different flavor. Well, I thought, it would be a muddle, but if there was one flavor swirled in that would be good. Better than good. Fast forward to last week, when I saw in my pantry an unassuming jar of Raspberry Chipotle Jelly. I do not think I need to explain further. These are sweet, a touch spicy, and just darn pretty! 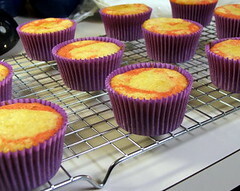 Heat the oven to 350 F and line a 12-cup cupcake pan with paper liners*. 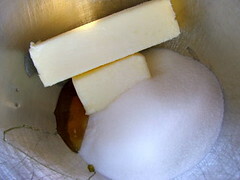 Allow your butter to come to room temperature, then blend it with the sugar and honey or golden syrup until fluffy. Add the eggs, one at a time, and the vanilla. Blend until well mixed. 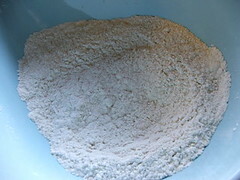 Sift the dry ingredients to combine. 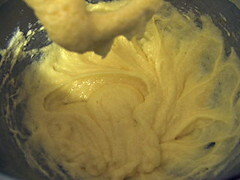 Alternately add the flour mixture and buttermilk into the butter, in three additions, beginning and ending with the flour. 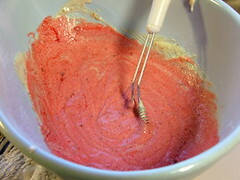 Pour about 1/3 of the batter into a bowl and mix in the Raspberry Chipotle Jelly and a few drops of red food coloring. Mix well. 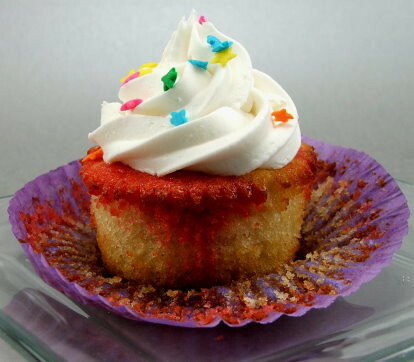 Fill the cupcake liners 1/4 of the way with the plain batter. Top it with two tablespoons of the raspberry batter then take a knife or toothpick and make a figure-eight pattern one time. Do not overswirl. 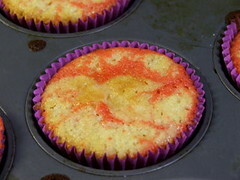 Top with one tablespoon of the plain batter and with a knife spread it toward the edges, but do not swirl in the raspberry batter. Most likely it will not reach the edges, but spread it as best you can. It does not matter if the pink shows on top. Bake for 20-25 min, or until the cake springs back when lightly pressed. 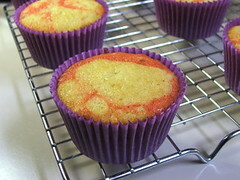 Allow to cool in the pan for 5 minutes, then turn out onto a wire rack to cool. 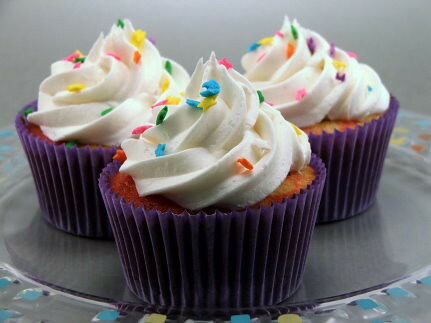 Frost as desired (I used some white buttercream frosting I had left from a wedding cake I made). 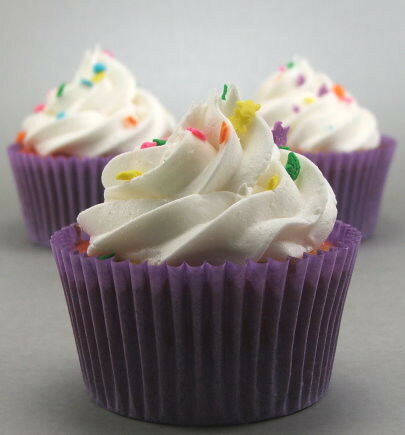 *The fun purple cupcake liners used in this post can be purchased at http://www.acupcakery.com/ . 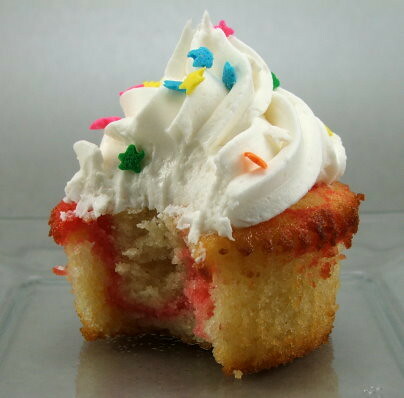 They retain their color, are slightly taller than the standard cupcake pan giving the cupcakes a better shape, and I can’t recommend them enough!